As the importance of coding grows each year, school districts inevitably feel pressure to fund clubs and find money for specialized instruction within the curriculum. The pressure is not exclusive to upper grades. If anything, educators such as Katie M. Blagden increasingly see the benefits of early introduction to coding language. As a science/technology/engineering/arts/mathematics (STEAM) coach and teacher at Ayers Ryal Side Elementary School, Beverly, MA, Blagden teaches rudimentary coding to kindergarten students using Kibo Robots. The robots feature coding blocks that come in sets of 10, 14, 18 and 21. Blagden personally made the pitch for Kibo funds to the school's PTO, taking care to integrate the school's stated mission into the plea. "Our district's mission is to get students prepared for the outside world and their career, and one of the things that could be important in careers is coding," she said. "Kibo Robots are extremely affordable. Our PTO provided funds, and we purchased 10 of the Kibo 10s at $229 each." Many younger grades do not have a 1-to-1 or bring-your-own-device (BYOD) policy, but the robots require no additional device. "That's the best part," said Blagden. "Our schools do not have a 1-to-1 policy for technology. Normally with coding, only one or two students can be doing it at a time. You can always get just a couple of Kibos and put them on stations. Kibo robots do not require any sort of computer connection, which is great for students and great for the school budget." Whether it's Kibos or other coding equipment, additional attachments can be acquired as needs increase. Public and private grants are available for updates and original purchases. On the private side, J.D. Ferries-Rowe has seen grant opportunities expand over the years, primarily because businesses, including tech companies, are keen to nurture talent and ultimately bolster their potential workforce. As chief information officer at Indianapolis-based Brebeuf Jesuit Preparatory School, Ferries-Rowe contends that the key to successfully getting private grants is making the case. "Develop a convincing case and you can approach businesses," he says. "We go to businesses that are affiliated with our school. Or we go to businesses that parents own. We make the case that our coding efforts are valuable, and then say, 'Here is what we need.'" Numerous private grants are available from various tech companies. Teacher Geek lists STEM grants by state. You can also find updated grant listings at thejournal.com/grants. "We teach coding and basic digital citizenship [to every freshman] as basic as Code.org and the Scratch programming environment [scratch.mit.edu]" said Ferries-Rowe. Both are free. "We use free programs to make sure we get 100 coverage coverage for all the kids. We quickly enhanced the Scratch part of that curriculum by adding Makey Makey Boards. You can find these in bulk from China for $25 per unit (retail $50). 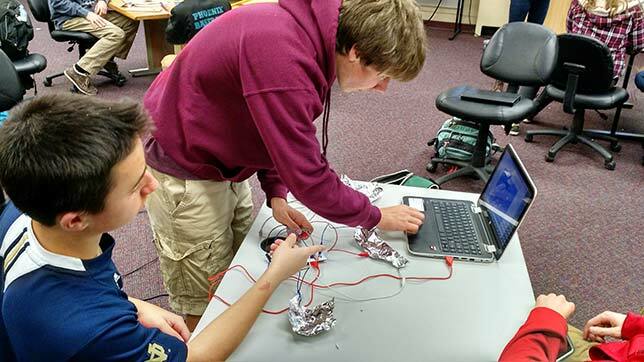 Since we work in teams of three, we were able to cover an entire classroom worth of Makey Makey Boards for $300." 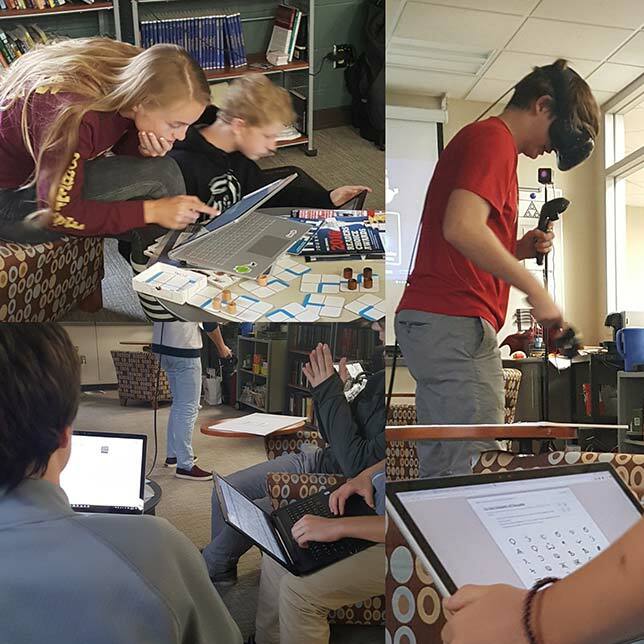 Brebeuf recently started doing coding-related virtual reality (VR) design using "co-spaces" which sells blocks of student licenses in groups of 50 for $75. Ferries-Rowe explains: "You can go to a company with a real dollar sign pitch and say, 'Here's how much it costs for an individual license to co-space, and we want 50 licenses to do the following projects and skills that you as a company are looking for. Can you help us with that funding?' If you go in with a pitch that has an actual goal and a real world number, along with the number of students that will be impacted, they are much more likely to give. You can pass the virtual hat." Additional fund-raising options feature new takes on familiar selling programs. "The most formalized one that I have seen is Vex Robotics," said Ferries-Rowe. "Their recommended fundraiser is selling Hex Bugs for $5 or $10 per unit and your club keeps a $1 or $2 per unit of profit. That's a school-by-school decision. I find it's more effective to make the pitch to affiliated corporations that have real world reasons to donate, rather than try to get kids to sell something." To varying degrees, the federal government has also set its sites on funding coding and computer science education. As reported in the Sept 25, 2017 USA Today and elsewhere, the White House directed the Department of Education to "commit $200 million every year to K-12 computer science education, which Code.org is marking as a victory for its nonprofit organization." The memorandum reportedly called on the Department of Education to commit at least $200 million of its grant funds to STEM education. "Today's $200 million-per-year commitment to computer science education marks a victory for Code.org, and for the movement we started four years ago to expand access to computer science and increase participation by women and underrepresented minorities," said Code.org founder and CEO Hadi Partovi in a statement to TechCrunch. 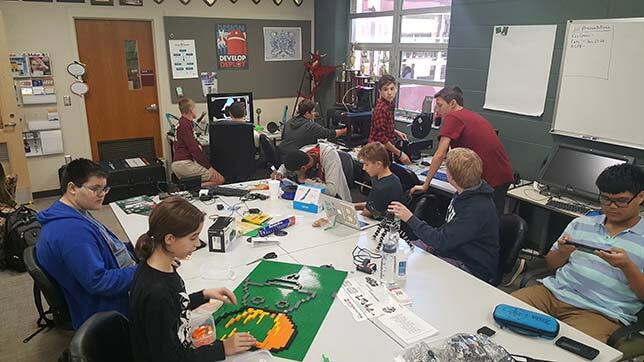 While school districts may indeed be building coding programs into their class structure, after-school clubs cost virtually nothing and are relatively unfettered by traditional curriculum structures. Zach Latta, executive director and founder of San Francisco-based Hack Club, has sparked the coding flames in recent years, providing curricula free of charge to help students in America and internationally to start coding clubs. Latta points out that the willingness to solve problems and build applications through coding language ultimately costs nothing. With educational tools and inspiration from Hack Club, motivated students are successfully getting their peers involved in coding. "One of the most important things about computer science is the idea of 'computational thinking' — using the same tools we use to reason about computers, like algorithms, to understand the world around us," said Latta. "This doesn't have to be done through a traditional computer science classroom. Scratch, developed at MIT, is a free visual coding playground that can be used in all types of learning environments. CS Unplugged (csunplugged.org/) is a popular set of resources to teach computational thinking without any computers." Hack Club (hackclub.com) works with high school students to start after-school coding clubs at no cost to the school. "We keep the program free because we believe that every student deserves the opportunity to experience the joys of coding without financial barriers," said Latta. "To date, after having the program launched for 1.5 school years, students have brought Hack Club to 1 percent of U.S. high schools in 30 states and 10 countries." Schools looking to pitch private companies for help with funding have powerful data points on their side. "Technology is increasingly the backbone of the modern economy," said the 20-year-old Latta, who was named one of Forbes' 30 Under 30 (Educational Category) in 2016. "Information technology is by far the fastest growing sector in the U.S., increasing by 148 percent in the past 5 years. Over 600,000 jobs in technology are currently unfilled and 250,000 new jobs are projected to be created by 2026," according the United States Department of Labor's Bureau of Labor Statistics. "An investment in coding programs is an investment in your community's future," he said. "Beyond paving the way for your future citizens to have high impact and fulfilling careers in technology, learning to code is a deeply empowering and self-actualizing experience. Coding shows young people that they can be the change that they want to see in the world."